EL CAJON – The Valhalla Norsemen clinched at least a share of the Grossmont Valley League championship with a 70-52 victory over visiting Granite Hills in front of a capacity crowd at the Thunder Dome on Friday. Valhalla improved to 23-3 (7-1 Grossmont Valley League) with the win over its long-time rival. Senior DOMANIC SAFARTA had 28 points and 11 assists while senior JORDAN GAINES added 19 points and 5 steals. Senior EVAN O’NEILL added 13 points and 11 rebounds. O’Neill made it 9-6 with a three-pointer, then Valhalla soon really got things going with a 19-2 run, as Gaines and Safarta knocked down triples. Safarta canned a trey to end the first half. In the third, Safarte found Gaines for a three-pointer to make it 39-22. Moments later, O’Neill bombed a three for a 20-point lead. Combined with El Capitan’s win over second-place Santana (5-3 GVL), the best the Sultans can now finish is 7-3. The Norsemen will travel to Santee to face the Sultans on Tuesday. MOUNT MIGUEL 48, GROSSMONT 38 – The Matadors won a key road game to stay in the thick of the Grossmont Hills League race. MICKEECE DUNBAR had 24 points, including five three-pointers, while teammate LAWRENCE GRAY added 18 points for the Matadors. The score was tied 17-all at halftime after Grossmont limited the visitors to just two points in the second quarter. The Matadors led by just one after three quarter, but outscored Grossmont, 15-6, in the fourth period. Mount Miguel improved to 5-1 in the Grossmont Hills League with just two games remaining in the GHL’s regular season. The Matadors are tied with Helix for first place, with Steele Canyon at 4-2, just one game behind. MYKOL RODRIGUEZ led Grossmont with 13 points, while teammate DOMINIC ESPINO added nine points, and NOAH O’CLANCY finished with eight points. NOAH VELASCO made a three-pointer in the first quarter for the Foothillers. MONTE VISTA 71, EL CAJON VALLEY 56 – Monte Vista senior DERRICK WILEY scored 23 points and the Monarchs defeated the Braves in a Grossmont Valley League game. Wiley delivered 11 points in the fourth quarter. “Wiley played well,” Monte Vista head coach MIKE TULLY said. Monte Vista sophomore ERNIE ARAMBULA made a pair of three-pointers in the first quarter, while senior teammate KENNY STEVENS also delivered a three-ball. 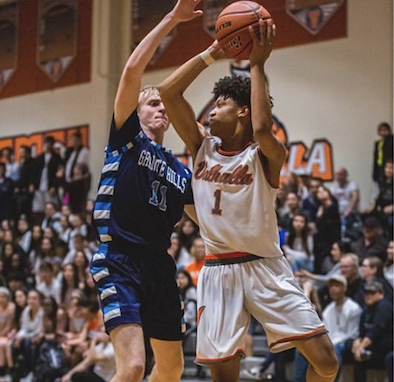 Arambula finished with 17 points, while Monarch senior forward DEMARCUS MCKAN contributed 11 points, as Monte Vista picked up its second Grossmont Valley League win of the season. EL CAPITAN 49, SANTANA 46 – The Vaqueros built a 28-19 halftime lead but the Sultans rallied to tie the game 36-all in the second half, however, El Capitan prevailed for the Grossmont Valley League win, dealing host Santana a crucial defeat in the chase for the league championship. Senior RANDY TUCKER had 16 points, 10 rebounds and five blocked shots for El Capitan. Junior JACOB PFITZNER added 13 points, including two three-pointers, and 10 rebounds for the Vaqueros. El Cap junior JAQUORI HARRIS finished with nine points and seven rebounds. HARRISON MORTON had eight assists and three steals for the Vaqueros. Santana got out to a 6-2 lead, but Harris had a basket to give El Cap a 12-11 lead in the first quarter, then Morton added a three-ball moments later. Vaquero freshman NICK HADGE had a three-pointer to give his team a 21-16 advantage in the second quarter. Tucker scored inside to make it 25-16 El Cap with 2:50 to go in the first half. Pfitzner connected for three points, to make it a 28-19 game. In the third, Morton scored on a break for 30-21 advantage. Later, Harris had another three to make it 39-36 El Cap. Santana will need to win its final two games in order to have a chance to share the league title with Valhalla. FOOTHILLS CHRISTIAN 85, ARMY NAVY ACADEMY 34 – The Knights rolled on Senior Night. Senior DERRICK CARTER-HOLLINGER had 21 points, four blocks and 10 rebounds, while senior teammate JAREN NAFARRETE added 10 points. 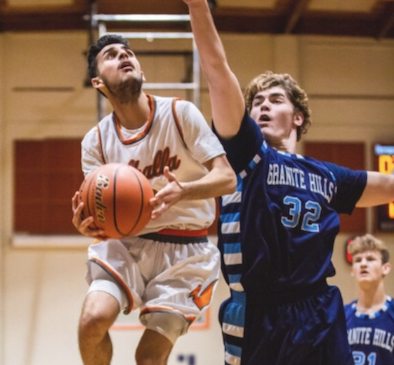 Junior YASSINE GHARRAM added 18 points for the Knights, who improved to 6-2 in the Coastal League. Foothills Christian, which had the county’s highest power ranking entering the contest, is currently tied to the league lead with Santa Fe Christian. La Jolla Country Day (5-3 Coastal) is just one game back. Foothills Christian will entertain Santa Fe Christian in the league’s Game of the Year on Wednesday at 7 at Cuyamaca College. The Knights play at Francis Parker on the final night of the regular season on Friday.